The Water Soil Flume is a versatile and multifunctional facility for physical experiments, especially concerning water and soil interactions. In its versatility, handling convenience and scale it is the only one of its kind in the world. Virtually all kinds of processes and dynamics on the interface of water and soil can realistically be simulated, even on prototype scale. A wide range of soil types, ranging from silts through sands, clays and even rock can be experimented upon. The Water Soil Flume is equipped with powerful auxiliary facilities to manufacture all kinds of soil types to match prescribed specifications and constitutions. Its basic experimental basin measures a depth of 2.5 m, a length of 50 m and a with of 5.5 m. The overall main basin can be divided up in smaller basins tailored to specific demands. 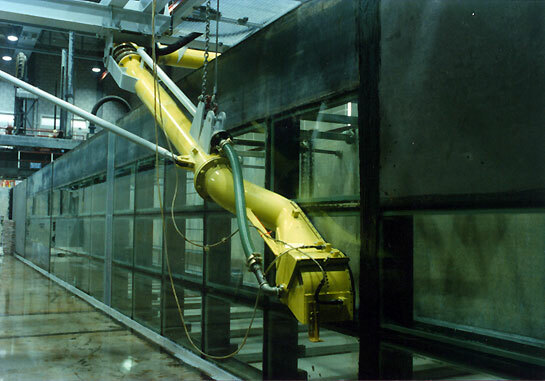 Also a glass wall is available installable on a variety of positions that allows visual inspection into the water and soil during the experiments. A large settling flume, water reservoirs and a variety of pumps and conduits support the logistics of water and water-soil mixtures. Two carriages on top of the flume enable conditioning of the soil, towage of experimental units, positioning and kinematics of experiments. The Water Soil Flume supports experiments in a fresh and salt water setting. Data-acquisition, analog/digital measuring devises and under water video possibilities are state-of-the-art. A small built-in workshop caters for direct hands-on support. The Water Soil Flume can be used for all kinds of researches in coastal, river, harbour, offshore and dredging issues. The dedication of the experiments varies form fundamental process research to verification and validation of theories, concepts and technologies. The scale and infrastructure of the Water Soil Flume allow a wide range of realistic investigations concerning these water soil interactions from autonomous natural dynamical processes to human operations, e.g. slope stability, turbidity currents, dredging, trenching, mining, anchor protection, pipeline issues, fishery.